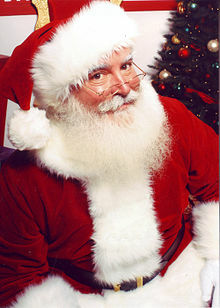 Bob Johnson's Rants and Raves: Is Santa Claus Real???? I guess you already know which holiday is my favorite. Just in case you missed my post on that subject you can read it here. So I guess you have already figured out that I am not a big Christmasy kinda guy. Well neither are any of my family. The reasons for this is probably rooted in my childhood or perhaps it is genetic. I am not sure. All that I can really remember about Christmas as a kid is that when the day came and we opened the presents I never got what I asked for. My parents were horrible present buyers. (not that it really matters I'm an adult now and have gotten over it) If my distaste for the holiday is genetic, we would have to take a look at my mother. She was a big Christmas person. The house was always decorated and music was playing. (So what happened to me?) I think it was the present thing. So keeping all of the above information in mind. I want to try to answer the question posed in the title of this post. "Is Santa Claus Real?" Well logically we know that there is no way that Santa could possible do what it is that he does. There is no one person at the North Pole making toys all day. Plus as an adult I happen to know that no fat guy with a beard enters my house to leave expensive presents for everyone. 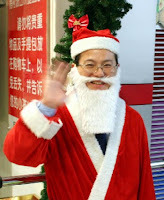 So is Santa Clause a feeling we get during this time of the year? Well, lets think about that for a brief moment. To try and determine the validity of this theory lets look at my experience as a Computer re-seller. Every year starting around the end of November we get people in that want to buy laptops and computers for someone for Christmas. They are usually rude and mean. So after a few weeks of being treated rudely we tend to get punchy. So much so that we can't wait until December 26th is here and the holiday is over. Over the years we have actually closed the business the week before Christmas so that we would not have to deal with the rude mean people. People that buy crap for people they barely know and expect crap from people they barely know ARE NOT IN THE CHRISTMAS SPIRIT. They are selfish bastards. People that buy crap for someone in October knowing that the person they are buying it for needs the item at that moment yet waits till December 25th to give it to that person is an EVIL A-HOLE. The dead beat that had his lay away item paid for by the guy in #3 walks out of the store saying "I should have put more crap on lay away since it was free"
The guy in #3 is simply trying to make good after acting mean and rude sometime in the past. People that walk around wearing santa hats and reindeer antlers ARE NOT IN THE CHRISTMAS SPIRIT. They are simply swept up in the wave of "I need to buy crap." Just because it is December people will say Merry Christmas, have a happy holiday or something similar and never really mean it. Case in point the other 11 months of the year they don't even say thank you or have a nice day. During this magical time of the year extended family members will only call during this time because they realize that they either need something or they feel guilt not calling the other 11 months of the year. Now lets keep in mind exactly what Christmas is supposed to be and what we are supposed to be celebrating. Does anyone remember? Christmas is a Christian holiday on December 25 that commemorates the birth of Jesus. I found this information on this page. So buying crap for people that you barely know and getting crap that you don't need from people that barely know you is NOT what Christmas is? So Santa Claus has nothing to do with Christmas. So when, exactly in the traditions of Christmas do we celebrate the birth of Jesus? HMMMM, I think that we should rename Walmart. The new name will be CHURCH. I mean after all that is where we buy most of the crap that we give to people who then take it back to Walmart for credit. Now here is the next connection that will probably make you say Ah Ha. Everything in Walmart is made in China. Chinese people are short. Hmm, see where I'm going with this. If China is where all the crap we buy is made then it would seem logical to say that Santa is Chinese, and Elves are really just Chinese children forced into sweat shops to create the stuff to send to walmart (church). Got it! Now I understand. So to answer the question posed at the start of this post. - Is Santa Claus Real? I would have to answer YES Virginia, Santa is real and he's Chinese. In addition, as requested by +Blogger I am sharing my opinions to Google. ROFLMAO!!!! OMG, Bob!! You have outdone yourself this time. I am literally laughing out loud at your post. Why? Because I have been saying most of the same thing for the last several years. Christmas lost its meaning for me several years ago, for various reasons. Now? I just laugh at the money people spend (begrudgingly I might add) on people they see a few times a year, they dont like much to begin with, and are hoping to not have to see them again until this time next year. Kids today seem to think that crap just falls from the sky and they EXPECT it and DEMAND it... Umm.. honey, your Mom and Dad are either working their behinds off to pay for the crap you don't need, don't DESERVE, yet still demand OR they're up to their eyeballs in debt and are barely making the minimum payment on all their plastic. I am LOVING your post!! Thank you for the amusement as well as your head on approach.